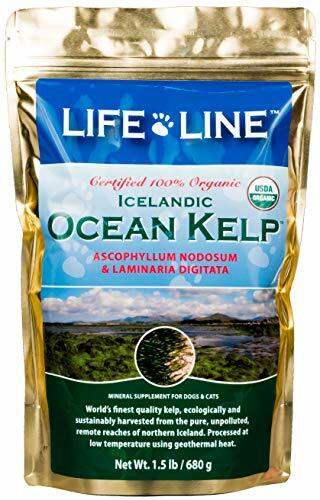 Icelandic Ocean Kelp from Life Line Pet Nutrition is a rich source of natural vitamins and minerals to support your pet’s overall health. Great for all life-stages from puppies and kittens to full grown dogs and cats. Kelp serves as nature's toothbrush, removing plaque and tartar and leaving your pet's teeth clean and fresh. It also replenishes moisture in pet's skin to heal dry, itchy skin. Our Life Line kelp comes from Northern Iceland and is packaged in the USA. It is 100% certified organic by the Washington State Department of Agriculture to USDA standards.